My toddler had a birthday a few days ago and is now officially a three-year-old. He couldn’t be more excited to tell people he is three although he will sometimes confuse three with being five or ten. He also insists that I am two, so maybe we will work on his understanding of age a bit this next year. ? A few weeks prior to his birthday, his grandma took him on a date to see “Finding Dory” in the movie theaters. He absolutely fell in love with the movie and talked about it for days. We even ended up getting him a little goldfish because he was so obsessed with all things fish. 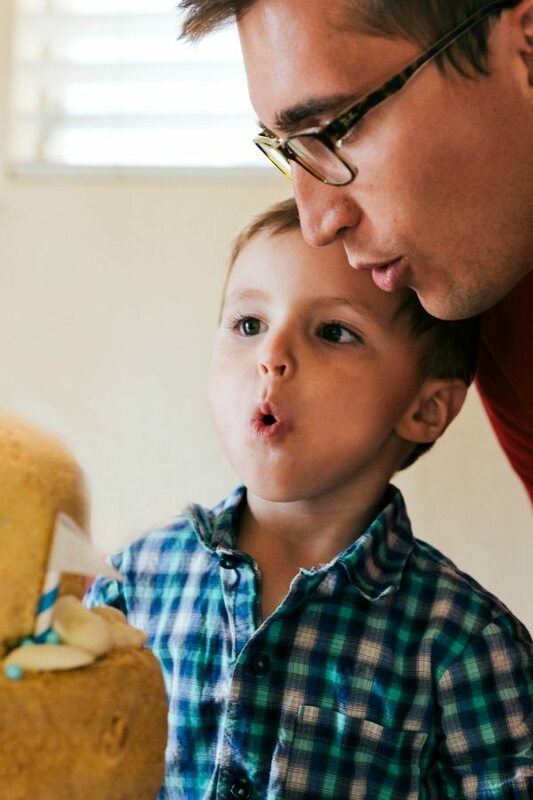 When we started talking about his birthday coming up and I’d ask what kind of party he wanted, he told me he wanted a “fishy party” and a “tall, tall cake.” And every time he said “tall, tall cake,” he would also point to the ceiling. 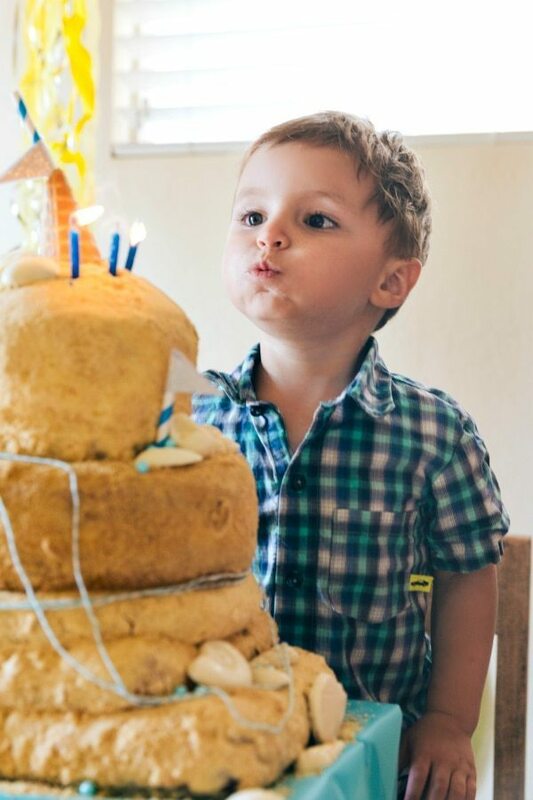 And so, of course, I had to make him a tall cake even though it looked pretty ridiculous, was so heavy that the bottom layer was completely smooshed, and required our freezer to be filled with cakes the week leading up to his birthday. ? Anyways, here are a few snapshots of his “fishy” party and the celebration. Happy Sunday! XOX. 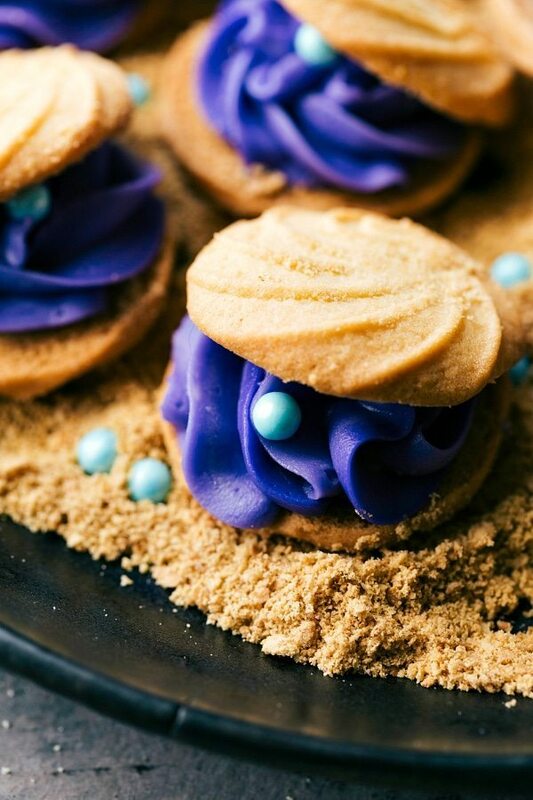 Sand dollar cookies: I used my favorite no-chilling required sugar cookie dough with cream cheese frosting for these. 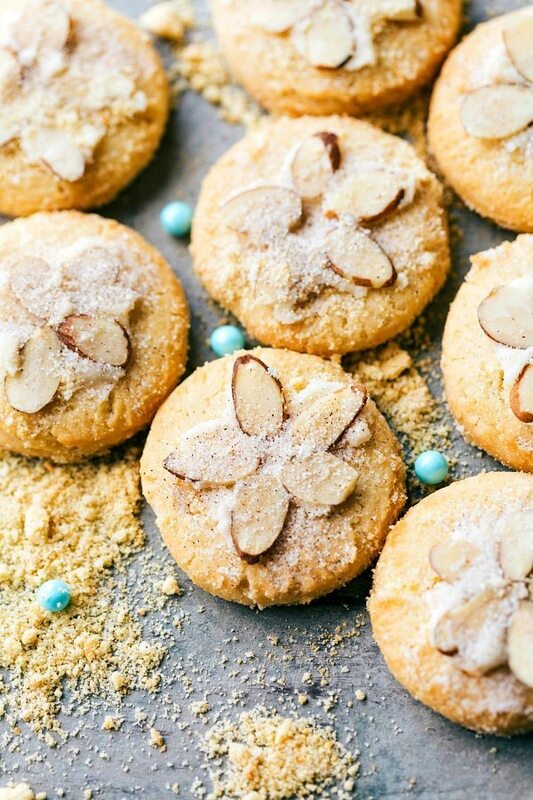 Frost a tiny bit of cream cheese frosting on top of the cookies and press 5 silvered almonds on top. Before the frosting hardens, sprinkle all the cookies with a cinnamon sugar mixture. (3 tablespoons white sugar + 1/2 teaspoon cinnamon). 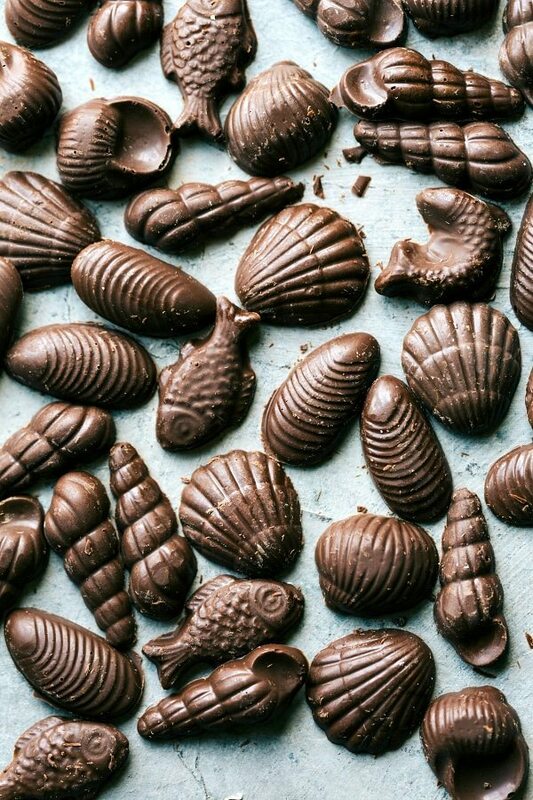 Chocolate Sea Shells: These are made by using a chocolate seashell mold I found on Amazon. Super quick and easy to make: just melt chocolate down and then pour it into the molds and let them harden at room temperature. Pop ’em out of the mold and they are ready to go! “Pudding Pails:” Grey is obsessed with chocolate pudding so I had to come up with some way to serve it on his birthday. I found these neon colored shot glasses on Amazon and super-glued some thread to each side to make a handle. 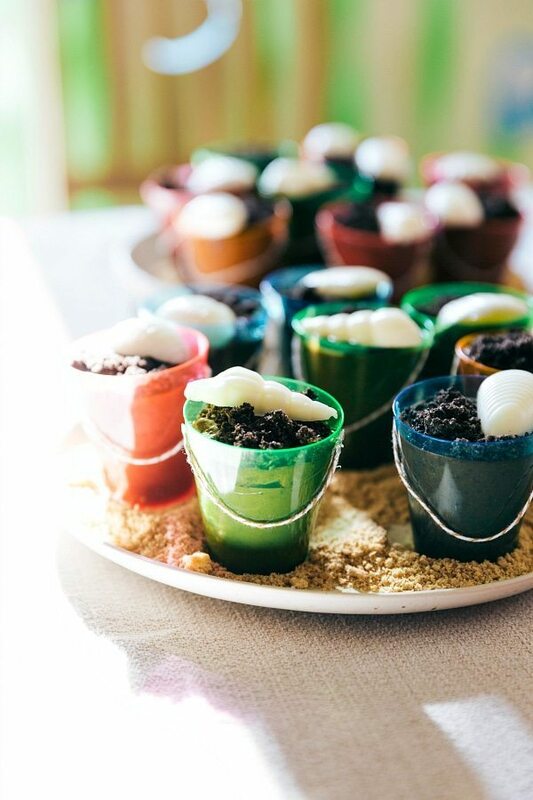 Pour chocolate pudding in the cup and let set in the fridge until the party. Right before serving, I threw some Oreos in a food processor and pulsed them until they were crumbs. 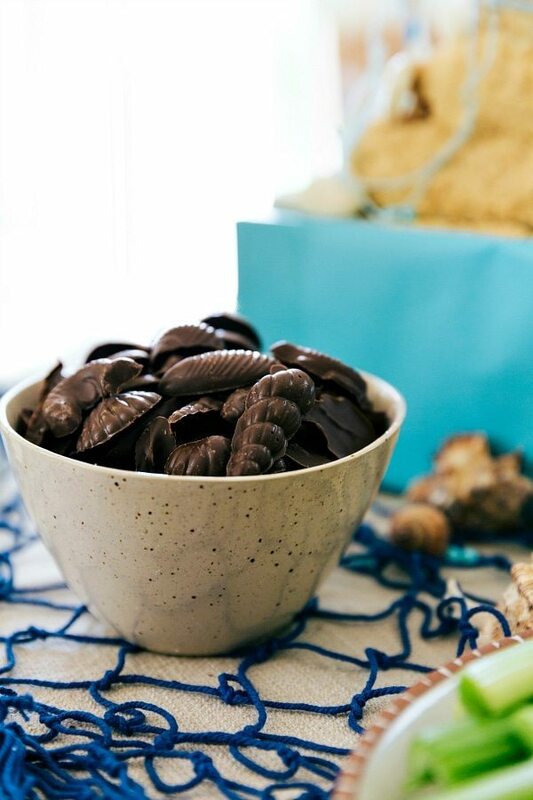 Pour those crumbs right on top of the pudding and garnish with a white-chocolate seashell using this seashell mold . “Crab” Spinach Artichoke Dip: I made a few spinach artichoke dips (recipe COMING SOON!) and baked them in mini ramekins. I served the dips with chips, a sliced baguette, and lots of veggies. 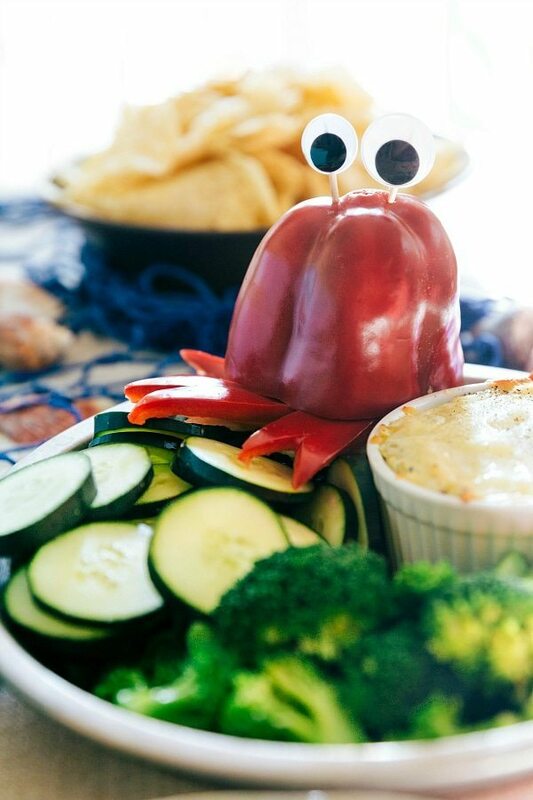 To make the crab up on top I used 2 red bell peppers. The first pepper formed the body (just slice off the top). With the other pepper I cut thick slices and then cut out a triangle shape at the bottom of the slices to make crab pinchers. The eyes are 2 different sizes that I superglued to toothpicks and stuck into the top (technically the bottom) of the pepper. 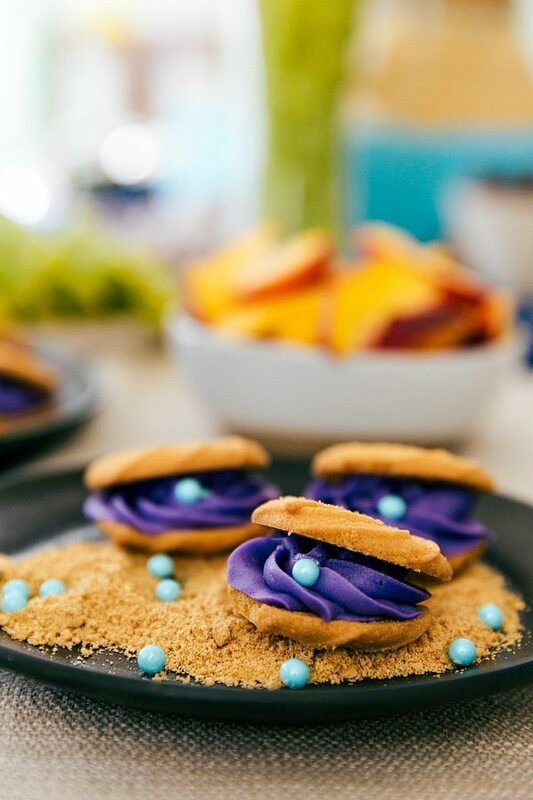 Clamshell Cookies: These are so easy to make! Because of their design and shape (and let’s be real: EASE), I bought pre-made Pepperidge Farm Brown Butter Rum Cookies to use for the top and bottom of this treat. The center is purple died cream cheese frosting (my favorite cream cheese frosting recipe here) and a large pearl sprinkle stuck in the center. Whip together the frosting and die it whatever color you want and then transfer the frosting into a prepared piping bag with a star decorating tip for this same look. Also, all of the “sand” you see on the plates are just graham cracker crumbs. I pulsed (in my blender) a bunch of graham crackers and then put them on the plates and used extra crumbs for the cake! 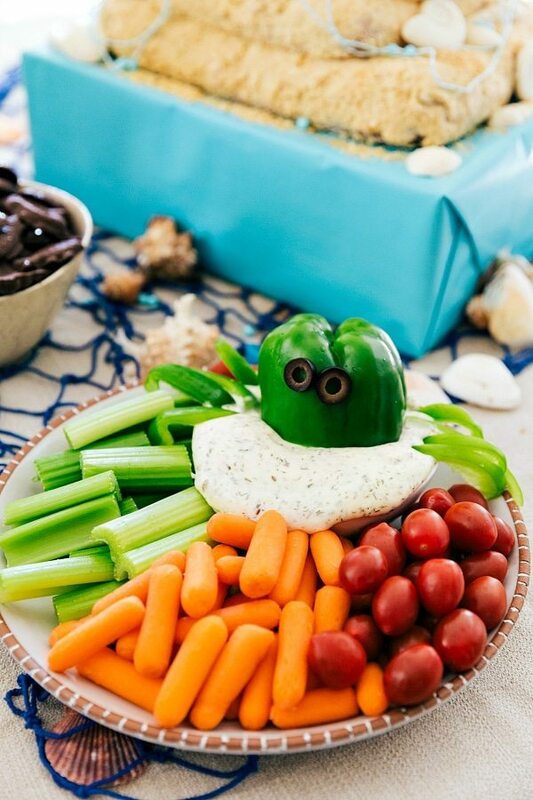 Octopus Veggie Dip: I made this veggie dill dip, put it in a small bowl on a large plate and then set out a ton of vegetables to put around the dip. The “octopus” is easy to make, although it kind of looks like a spider ?. Poke 2 toothpicks into the bottom of the pepper so you can barely see them. Slip a sliced olive on the end of each toothpick. Cut off the top of a green pepper and put it upside down on top of the dip (do this RIGHT before serving as it has a tendency to slowly sink down). Using another green pepper, cut out 8 octopus legs and put around the “body” of the octopus. 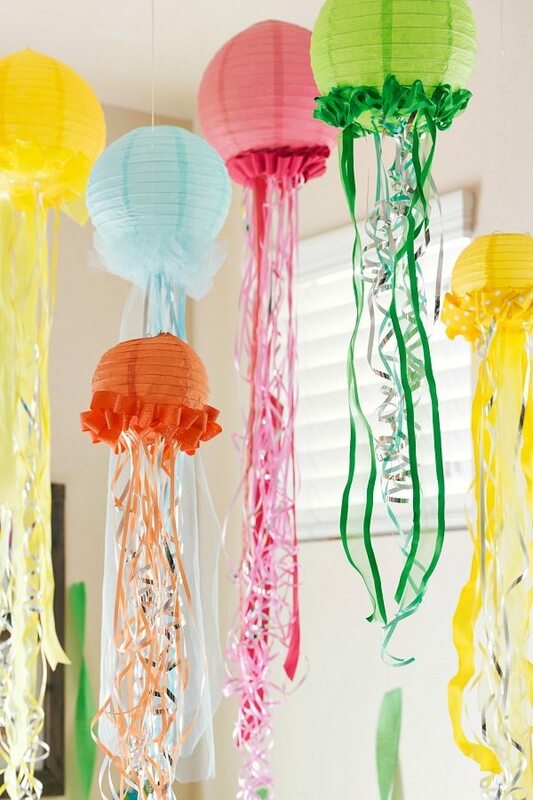 Paper Lantern Jellyfish: I bought a bunch of paper lanterns , a variety of curling ribbon , and used ribbons or tulle I already had to make these. 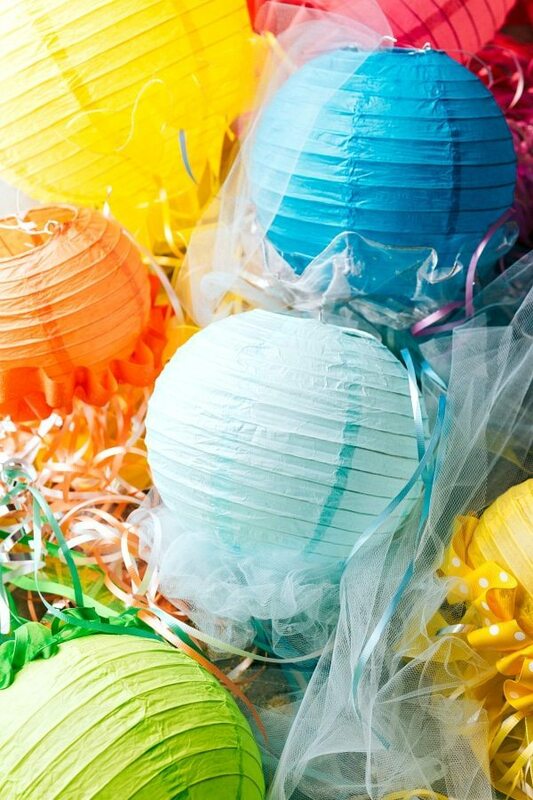 I set up the paper lanterns first and then used hot glue to secure the ribbon around the bottom third of the lantern. I loosely folded the ribbon to give it an undulating effect. Then I just hot glued the curling ribbon and a few regular pieces of ribbon or tulle under each lantern. 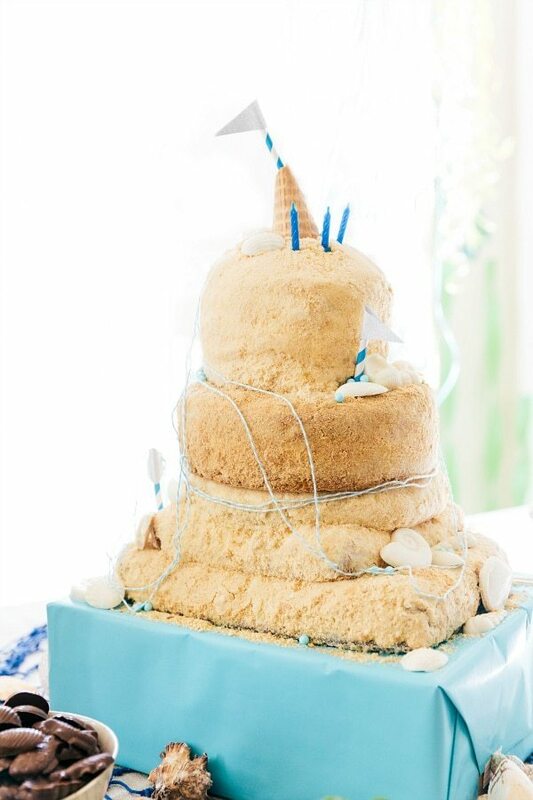 Sandcastle Cake: This cake is a little ridiculous and definitely didn’t need all those layers (it was so heavy, you can tell the bottom layers are smashed! ), but since Grey wanted a tall cake (for some reason, I have no clue where he came up with that?) I decided to make it 7 layers tall. The bottom is a 9 x 13, next layer an 8 x 8, the next three layers are 9 inch rounds, and the top 2 layers are 6 inch round cakes. I baked them all one day and then very tightly wrapped the cakes and frozen them until the day before the party. 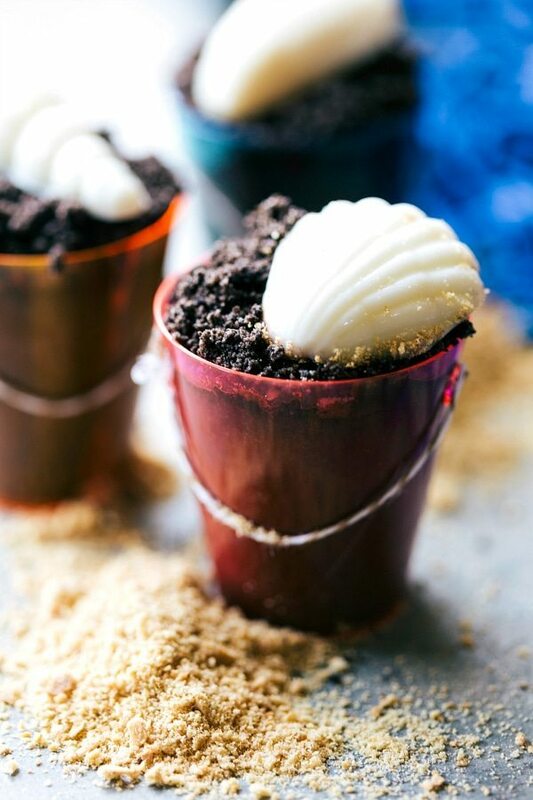 I made this cream cheese frosting and then frosted each cake and then immediately pressed on the “sand.” I used blended graham crackers for the middle layers and blended golden Oreos for all the rest (for a different flavor and look to the cake.) The top 4 cakes are layer cakes so I frosted in between those and then set them on top of each other. This made it easy to cut into the cake because you could just remove an entire “cake” and cut into that. The decorations are some leftover blue pearl sprinkles, white chocolate seashells, blue striped straw s with sparkly paper flags, and the top is a piece of a waffle ice cream cone. 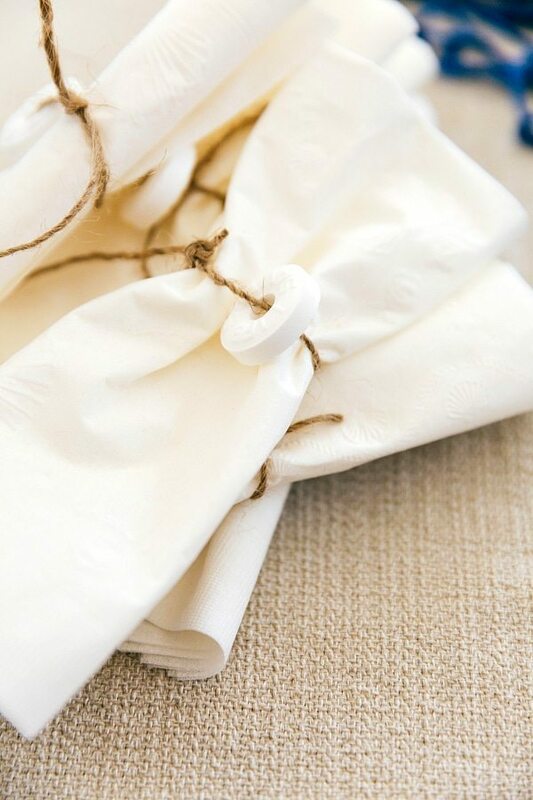 Lifesaver Napkins: I rolled up a napkin, strung a mintly lifesaver through some thin twine, and tied the mint twine around the rolled up napkin. “Seaweed:” This is a lot of bang for your buck as far as decoration. 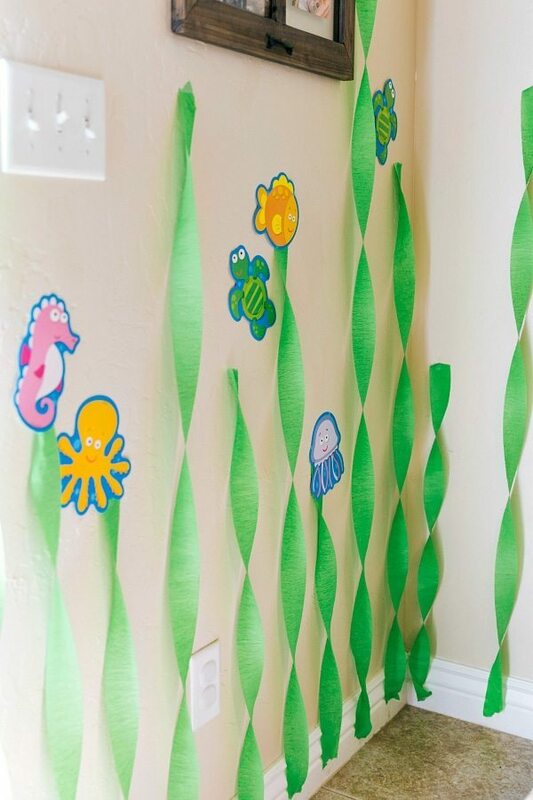 Use crepe paper along all of the walls to give an instant “under-the-sea” effect for very little cost and effort. Okay, maybe a bit of effort 🙂 The little sea life cut-outs animals throughout the seaweed were another Amazon purchase. Happy Birthday little guy. We sure love you! This post includes a couple of affiliate links for exactly what I purchased for this party. This means if you purchase through a link I will receive a small commission without it costing you any additional money. Thanks for your support! 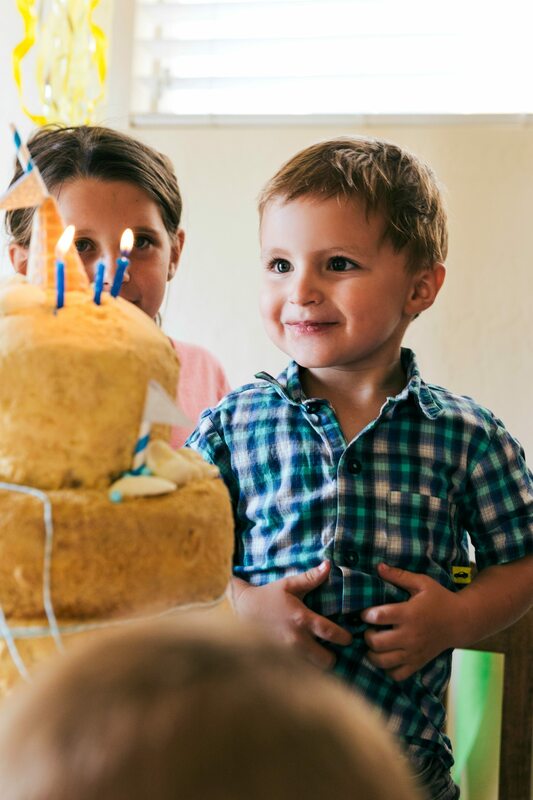 Such an adorable party you put together! 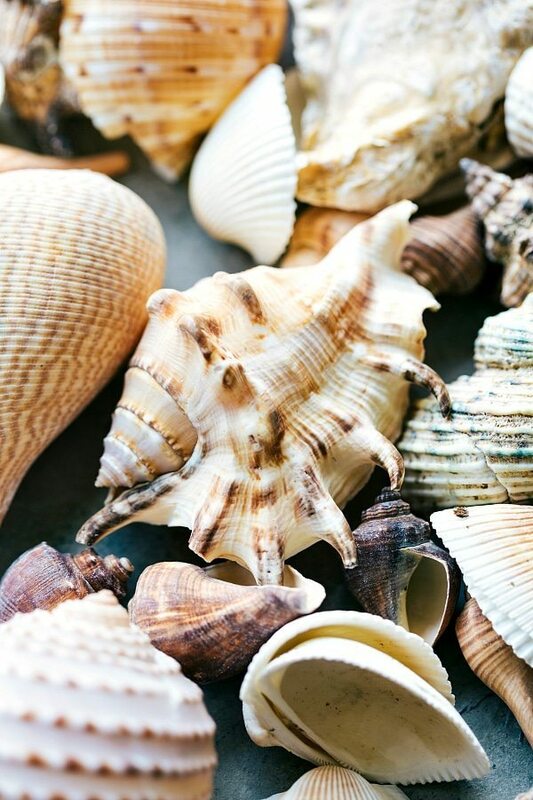 Love the sand dollar and clam shell cookies. Happy 3rd Birthday Grey! THIS IS THE CUTEST THING I HAVE EVER SEEN!!!!!!!!!!!!!! The jellyfish are the cutest!! What a fun birthday party! Just amazing! Your son looks like an angel! I am commenting about 1 year later. I think I am gonna see his 4th birthday!